Wade Winn in court for an arraignment hearing on Feb. 13, 2019. 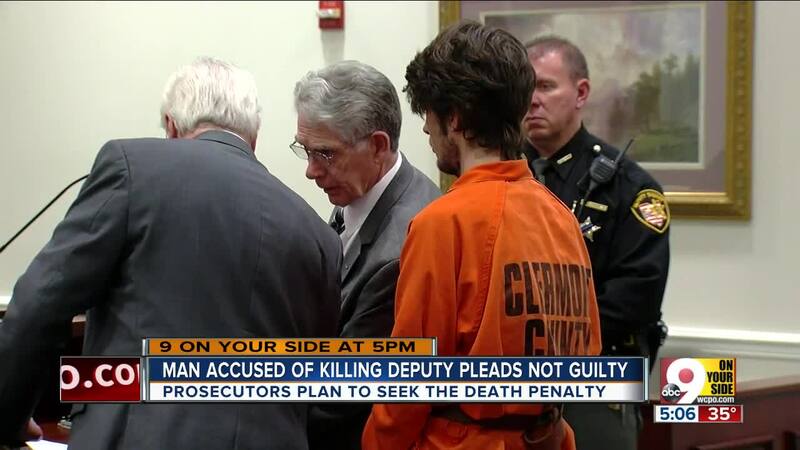 BATAVIA, Ohio — The Clermont County man accused of fatally shooting a deputy who answered his late-night call for help pleaded not guilty Wednesday. A grand jury on Tuesday indicted Wade Winn on fourteen counts. Winn, 23, called police on Feb. 2 to report a burglary in his Pierce Township apartment. When they arrived, however, he refused to leave and became increasingly suspicious they were there to harm him. The 12-hour standoff lasted overnight, ending with Detective Bill Brewer dead and Winn’s apartment in flames. His defense attorney argued serious mental health issues had been a contributing factor. During an arraignment hearing Wednesday, Judge Anthony Brock read the 14 charges. Winn pleaded not guilty, and Brock ordered he be held without bond. Winn's attorneys asked for a gag order, which Brock said he would approve. Winn had initially been charged with aggravated murder and attempted aggravated murder for shooting Brewer and Lt. Nick DeRose, both of whom believed he was suicidal and attempted to enter his apartment. DeRose survived and attended Winn’s first arraignment on crutches the following Monday. The grand jury indictment added attempted murder charges for endangering the lives of six other deputies: Dep. Daniel Spears, Dep. Michael Ross, Detective Nicholas Crouch, Dep. Douglas Scott and Sgt. Michael White. It also charged him with six counts of purposefully attempting to kill law enforcement officers in particular, which is a separate offense in Ohio. Clermont County Sheriff Steve Leahy said in a written statement that he was "pleased" with the indictments returned by the grand jury. Clermont County Prosecutor Darren Miller announced the Monday after the shooting he intended to seek the death penalty for Winn. If Winn is convicted on the aggravated murder charges, he faces a potential sentence of death, life in prison without parole, life with parole eligibility after 25 years or life with parole eligibility after 30 years. Mourning for Brewer dominated the following week throughout Pierce Township. Gov. Mike DeWine was among hundreds who attended his visitation, and more than 1,500 people were at his funeral at Mt. Carmel Christian Church. A pretrial conference is scheduled for Feb. 28.